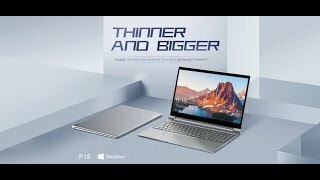 The Teclast F15 is another budget laptop from China. However, despite its relatively low price it is equipped with an aluminum case, similar to the CHUWI LapBook SE or the Jumper EZbook S4. 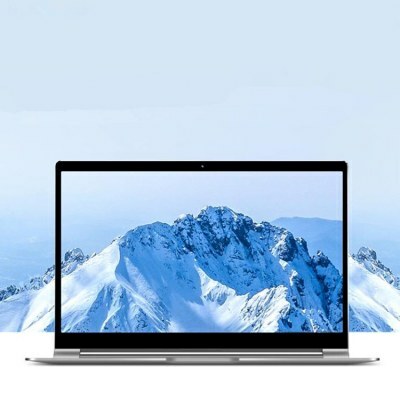 In contrast to these manufacturers, who have placed their logo quite large on the back, the design of the Teclast F15 is more based on the Xiaomi Mi Notebook Air. So the case is in a “clean” design, without logo or anything else. I personally like this simple and unobtrusive look. The case is made of matt aluminium with rounded, slightly downward corners on the display lid. Only the Teclast logo is located in the upper left corner of the display lid. The edges of the display lid are polished and run as a narrow line around the device. The display is embedded in the inside of the lid and is protected by a removable film. According to various online contributions, one should be extremely careful when removing the film, as there is still a film underneath and there can be unattractive blistering. The main body is also made of aluminium with the same polished finish as the lid. A recessed grip below the touchpad simplifies opening the lid. Opening with one hand does not work. The hinge causes a short, deliberate resistance when closing the lid, until the lid snaps in elegantly with a “plop”. The underside made of matt aluminium accommodates 4 sufficiently large rubber feet, which ensure a tidy stand on smooth surfaces. The case weighs only 1.3 kg, is 13mm high at the thickest point and 10mm thin at the thinnest point. The outer dimensions are 33.2 x 22cm. In addition, the underside is fastened with 10 Phillips screws and can be completely removed after opening the screws. A further screw fastens additionally a small cover, under which a M2 2042 SSD can be inserted afterwards. Altogether there is nothing to complain about in the case processing. Nobody would suspect a low budget notebook at sight. The Teclast Tbook F15 was builted-in 15.6 inch IPS panel resolves with Full HD and is glossy. The typical IPS viewing angle stability is guaranteed. The contrasts and colours are well displayed. Unfortunately, the display has a slight yellowish tint, which is especially noticeable on a white background. The display brightness is sufficient. Even the WM livestream could be clearly displayed on the balcony in the shade. However, the uneven screen illumination at the bottom of the screen can be slightly annoying when watching videos with a black border. Inside the device works the Intel N4100 of the Apollo Lake series which is usual for this price class. The four computing cores clock with a base rate of 1.1 GHz and a boost mode of up to 2.2 GHz (single core burst, multi core burst max 2.1 GHz). The SoC integrates the Intel HD 500 graphics unit. It supports DirectX 12 as well as hardware-accelerated playback of H.265 videos (HEVC). This video codec is mainly used by streaming providers to drastically reduce the size of videos compared to the older H.264 codec with a comparable video quality. Playing 4K videos runs without any problems. The RAM is 8GB DDR4 RAM. This is soldered to the mainboard and cannot be extended. The built-in 256GB M2 SSD reads sequentially with 464 MB/s and writes with 396MB/s in the benchmark. Such good results can hardly be found on comparable devices. The boot time is okay with about 25 seconds. The system performance is much faster than with the Chuwi Lapbook Air. Teclast has done almost everything right with the touchpad. It’s big. Very large even and comes with almost 8×11 cm. It supports all relevant features like Multitouch and Pinch to Zoom. Unfortunately Tab to Click sometimes doesn’t work for a reason I don’t know. This seems to be due to the driver. However, since the touchpad is produced by the well-known manufacturer Synaptics, the probability is high that a patch for this problem will come. In such a case you can also use the hardtouch. For the keyboard, Teclast F15 uses black keys with white lettering. The keyboard layout comes in the typical QWERTY design. Since it is difficult to do without umlauts in German-speaking countries, it is recommended to use keyboard stickers or to set the keyboard to the English international keyboard. The keyboard has no backlight. The pressure point and the writing feel are good. The Fn keys do what they should and even provide a virtual number pad. On the left side of the case there is a Micro HDMI port for a maximum output of 1080p at 60Hz. In front of it there is a USB 3 port. It is closed by a rubber cap, which can be easily lost. On the right side of the case there is the charging port from back to front, followed by a 3.5mm jack port, USB 3 port (again with rubber cap) and a MicroSD port. Both USB 3 ports deliver good benchmark values in combination with a Patriot Supersonic XT 64GB stick. The sequential read rate was about 220MB/s and the write rate about 90MB/s. The MicroSD card slot delivered with a 128GB SanDisk Ultra read and write speed of about 25MB/s. The MicroSD card slot was able to read and write with a 128GB SanDisk Ultra. According to my online research it should not work faster even with faster MicroSD cards. However, the speed of the MicroSD port is sufficient as a “data grab”. The webcam resolves with 720p and delivers rather moderate photos and videos typical for a device class. The display is pale, very noisy with an enormous motion blur. For occasional video chats it serves its purpose. The built-in microphones deliver good speech quality and the loudspeakers also deliver good sound so far. For WM streaming I could do without external loudspeakers. The built-in WLAN module works with b/g/n ac standard and delivers 7490 download values around 50Mbit/s to my Fritz Box. The Bluetooth standard is given as 4.2 and is therefore up to date. According to BatteryMon, the battery capacity of Teclast F15 is almost 6000 mAh. The charging of 22% -100% took approx. 2h and 5m. A WM live stream swallowed after 45 minutes about 20% battery at full display brightness. With a reduced display brightness (75%), the maximum battery life of Office or Youtube is 6 hours. Thus, the battery life is in the lower average. However, the battery life of 4-5 hours specified by the manufacturer is reached.